Bastille Day, July 14th, is the French National Holiday commemorating the anniversary of the storming of the Bastille fortress prison on July 14, 1789. That act is seen as the symbol of the uprising of the French Revolultion and the start of the modern nation of France. Here in Philadelphia the biggest Bastille Day celebration is held every year outside the walls of Eastern State Penitentiary. The reenactment of the Storming of the Bastille is rather playful, tongue in cheek, and in the style of Monty Python. 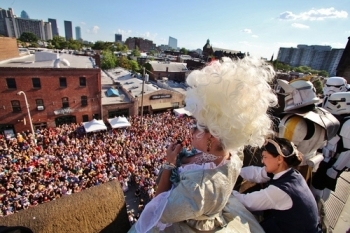 Dozens of French revolutionaries storm the walls of the Bastille/Eastern State, a 'drag' Marie Antoinette guards a top the walls and real guillotine waits to be used. 3,000 butterscotch Krimpets will rain down on the crowd on cue to Antoinette's oft attributed quote "Let them eat (Tasty)cake!" The storming happens at 5:30 pm. New for this year is a very special performance by the experimental cabaret troupe, The Bearded Ladies. They will perform a history of the revolution starting at 4:30. You can view their instructional videos below so you can join in the performance.